The H Lee House (1928) was designed by noted British architect Frederic C. Clemeshaw and built by Scottish carpenter George Simpson at 8450 Troy Street, Lemon Grove, for San Diego auto reconstruction business owner Harold Lee. Lee commissioned the building of the home in the style of his native England after reportedly falling in love with Simpson’s own Tudor home nearby. The house was part of the American Country Home Movement of the 1920s, a phenomenon associated with the rising popularity of the automobile. The house is a finely detailed example of the Tudor Revival style, retains a high degree of integrity, and has been a visual landmark in the town for decades. 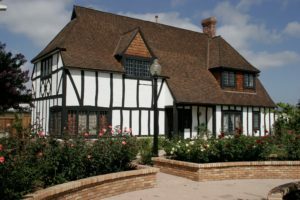 It is a California State Historic Site that embodies distinctive characteristics of the Tudor Revival style and represents the work of a master. The Lemon Grove Historical Society, in partnership with the City of Lemon Grove and the California Transportation Department, rescued the home from the path of SR 125, a new freeway artery on Lemon Grove’s eastern border. In July 2002 the house was relocated to Civic Center Park, where it flourishes today as the H Lee House Cultural Center, the site of concerts, lectures, art exhibitions, social events, numerous rentals and more. Please contact us for rental information.